Just had to post this quick blog. I was visiting Twitter and I came across a link to an article attached to a tweet by @AlliCrow better known as Graphic facilitator AllisonCrow Flanigin from Austin, TX. The article can be accessed here. I was so impressed with the article that I quickly made up a MindManager Mind map overview of the Visual Accessing Cue's. It is clear to see; mapping out information and knowledge just works. Being a Visual mapper (Facilitator) includes more than merely mapping out thought processes and helping clients to become more graphically aware of the value of Mind-Visual-Knowledge mapping. I have personally delved into studying the human condition, and I am continuously learning new and exciting things about communication. One of the fascinating subjects I have become a student of is NLP (Neuro Linguistic Programing). I certainly don't claim to be an expert in the use of this rather interesting set of tools; put it this way; NLP for dummies is a book I bought awhile ago and it's kind of worn out now with use. I also bought a book a number of years ago now called "Words That Change Minds" by Shelle Rose Charvet; I encourage you to purchase Shelle's excellent book, and I'm sure it will challenge, inspire and motivate you to look out for the connectiveness of how we communicate, observe and influence our environments. Shelle has an excellent site you can access here. We have many excellent tools available these days to ensure we are reasonable organized, with less stress, and more productive. Yet for apparently inexplicable reasons (that's a lie), we seem to be less organized, more stressed and willfully unproductive. 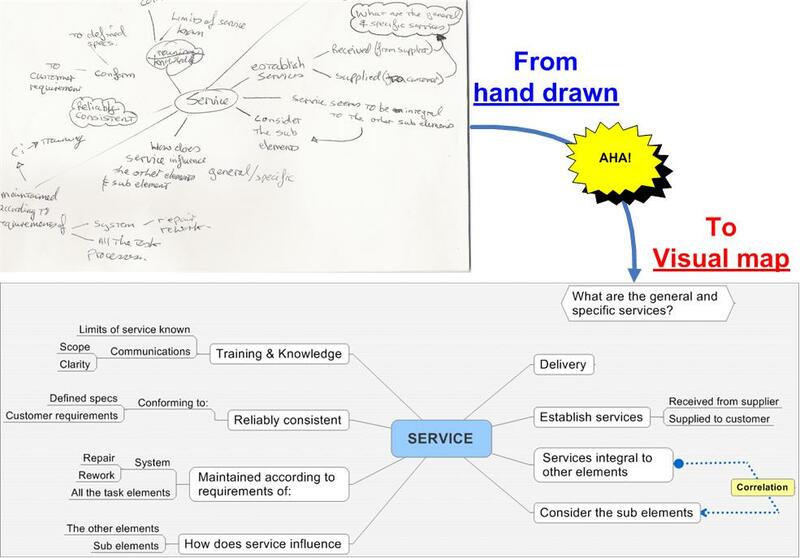 Having been involved in helping many clients with personal, academic and business information management issues; I am convinced the genesis of change for many is the introduction to mind mapping tools and methodologies that can exponentially enhance their information management skills. 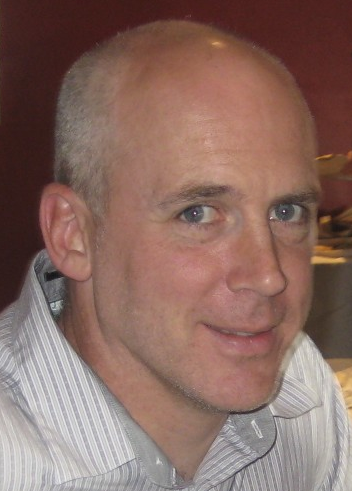 Take a look at the John profile below, it may resonate with you. John could be a Jane, it's certainly not gender specific, yet this profile is all too common. 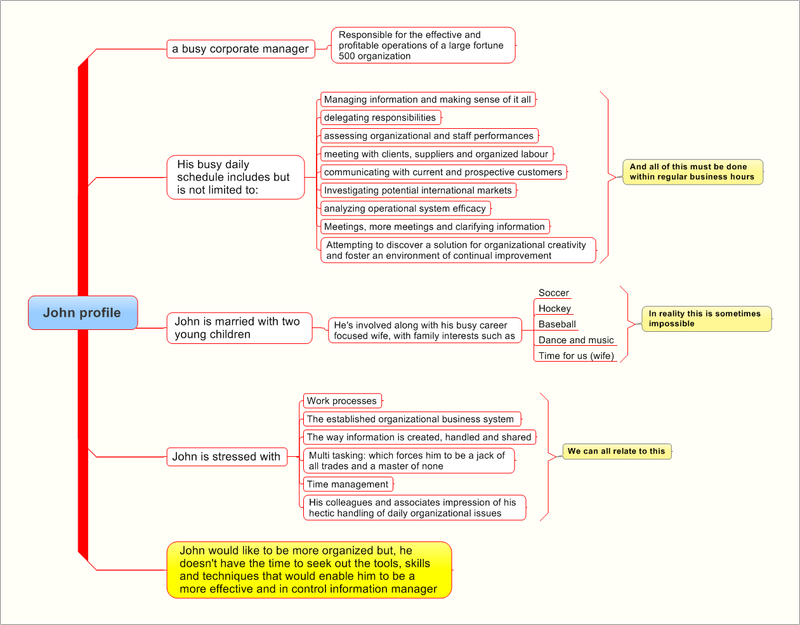 The genesis of change for John or Jane IMO, would be benefited by an introduction to the tools and methods of Mind mapping. Why? Well in my experience an introduction to Mind mapping is in many cases the starting point for a shift in the users conscious awareness of a more effective way to create, manage and exchange data, information and knowledge. Each and everyone of us manages information; of course we do, we are humans and therefore we are thought generating systems. We are capable of whole brain thinking that includes deductive and inductive thinking, we think not only in words, images and numbers, but we generate contextual information, and in turn create usable knowledge. This is just the way it is for we humans. I am very privileged to know such visual mapping thought leaders as Roy Grubb, John England, Nick Duffill, Toni Krasnic, Mark Wogan, Olin Reams, Michael Deutch, Brian Friedlander, Pascal Venier, Vic Gee, Wojciech Korsak and many others I fail to mention here (apologies). Some are business consultants and some are developers of excellent software products; they are more than capable of guiding you into a place where you can choose a product that suits your information management needs and wants. So; as you search through the Visualmapper blog list to date (top right of this page), I hope you find relevant information that assists you in solving the issues that John and Jane seek to remedy. OK so I’ve just alienated half my readers - post-PC Apple none sense - pah? 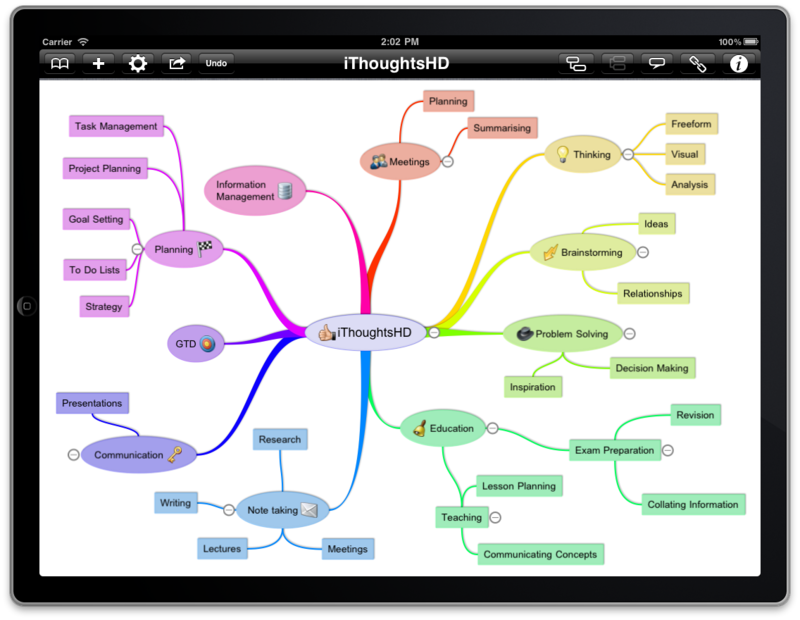 My name is Craig Scott and I’m the developer of iThoughts - a mindmapping app for the iPhone and iPad. 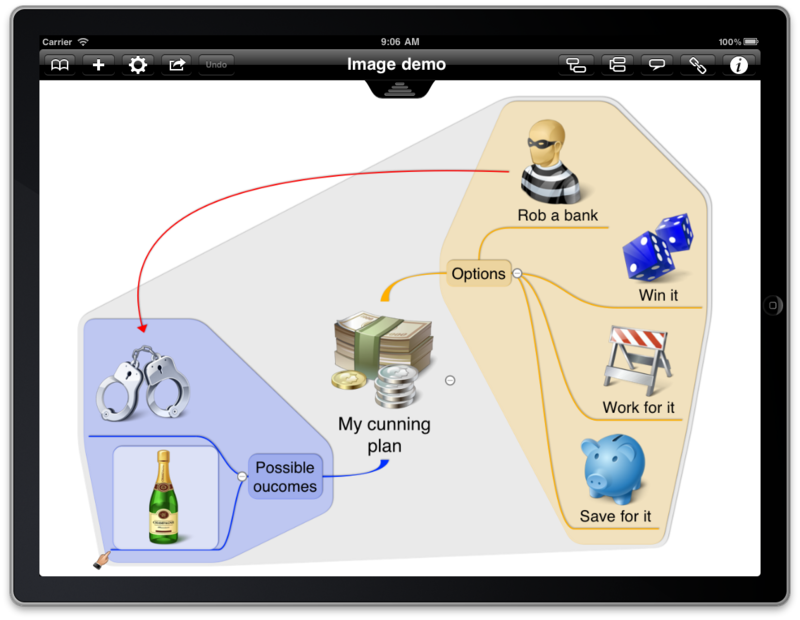 In this article I’m going to talk a little about mobile mindmapping and why it’s a good thing - but mostly I’m going to try and sell you my app. I think Mr J has nailed it. The world is moving towards more ‘personal computing’ - where people do much of their e-work on personal devices such as phones and tablets. The desktop will not disappear, but it will be relegated to more of a back office role. All the e-thinking (the valuable stuff) will be captured on personal with a (small p) computers. Mindmapping is a killer app in this ‘post-PC’ world. The killer for me, though, is that the ‘Apple Vision’ for the iPad experience is so in-sync with the requirements for an ‘Idea Still’. The Apple Vision is to put people directly in touch with their ‘stuff’ (photos, music etc.) - the iPad itself and its apps should go unnoticed. 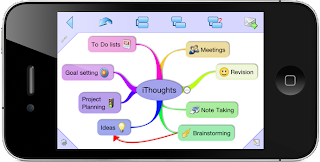 This is what mindmapping has been waiting for - a way for people to focus entirely on their thoughts and ideas unencumbered by complex tools and user interfaces. So to repeat my previous assertion, mindmapping was and is great on the PC but its true potential will really be unleashed on the ‘post-PC’ device. • Triple Tap - a quick way to create new topics using only the keyboard. • Desktop App Integration - Mindmanager, XMind, Freemind etc. • Folders - to organize your maps as you would on a desktop. • Compatibility - must ‘play nicely’ with other applications. • Connectivity - iPhone and iPad are mobile devices. • Functionality - it’s a tool - it must assist the user. • Usability - if it’s not usable - people will not use it! In addition it can import/export OPML which is supported by applications such as Omnioutliner, Scrivener, Curio and many others. Maps can also be exported as images and PDF files. This enables users to collaborate and share maps seamlessly using a ‘single tap synchronization’ feature. 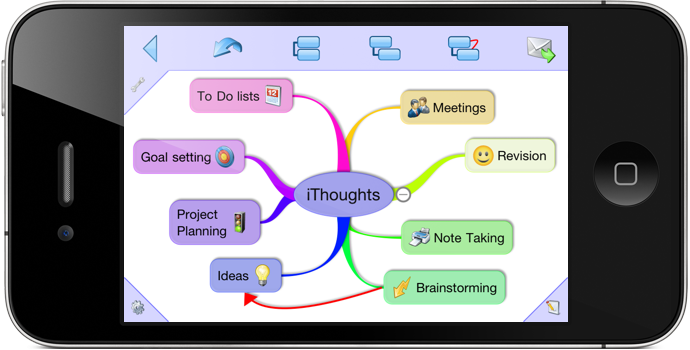 Maps can also be emailed to and from iThoughts, uploaded/downloaded over WiFi using a browser and transferred using iTunes. • Auto Organize feature keeps things tidy. • Auto Colour/Shape selection keeps things visual. • Drag/Drop Topics and Branches for speedy organization. • TextExpander integration and Keyboard Shortcuts (triple tap) for fast data entry when brainstorming. • Unlimited Undo/Redo for those second thoughts. • iOS4.2 Fast App Switching helps maintain your train of thought. • Cut/Copy/Paste information between branches, maps and other applications. So what does the app look like?